Despite its seemingly endless political and financial travails, Obamacare has taken a big bite out of the number of uninsured Americans since it was enacted in 2010. An estimated 20 million more people are now covered by private health insurance obtained through subsidized government exchanges or expanded Medicaid for the poor. But as the curtain begins to ring down on President Obama’s administration, roughly 20 million to 24 million people still lack health insurance, a huge piece of unfinished business that will be left to the next president and a new Congress to address. And that raises two interesting questions: precisely who are the uninsured today and why haven’t they been able to obtain coverage? A national survey by the Commonwealth Fund conducted last February through April finds “notable shifts” in the demographic composition of the uninsured since the Affordable Care Act first took effect in 2014. A quick snapshot of the detailed findings tells the stories of millions of people either purposefully rejecting health care insurance, not qualifying for a federal program, or being unaware of their options to acquire coverage. Latinos. Hispanic residents make up 40 percent of the uninsured in this country, an increase from just 29 percent in 2013 before the new insurance law took effect. While there are a number of socio-economic reasons for this, the biggest is that Obamacare and other taxpayer supported federal programs bar illegal immigrants from Medicaid, Medicare or subsidized marketplace coverage. About 46 percent of uninsured Latinos in 2014 were non-citizens, according to the Census Bureau. Millennials. Young people ranging in age from 19 to 34 currently make up almost half of the uninsured in the country. These young adults constitute the largest share of uninsured people across all age groups. And like the overall adult population, the vast majority of uninsured young adults (96 percent) have incomes that would make them eligible for marketplace subsidies or Medicaid – but they aren’t signing up, mostly because of the high premiums and deductibles. The very poor. Not surprisingly, uninsured people tend to have the lowest incomes. The vast majority of uninsured adults – a startling 94 percent – have incomes under 400 percent of the federal poverty level, or $47,080 for an individual and $97,000 for a family of four. That makes them eligible for either Obamacare marketplace subsidies or Medicaid, although a third of them live in one of 19 states that have not yet agreed to expand their Medicaid coverage to poor single adults who are able to work. Southerners. From a strictly geographic point of view, living in a southern state increases your chances of going without health care insurance. Nearly half of uninsured people live in southern states, where Republican legislatures or governors haven’t agreed to expand their Medicaid programs authorized under the Affordable Care Act. Poor people living in southern States that haven’t expanded their Medicaid program are uninsured at twice the rate of those living in other states – 35 percent to 17 percent. Small business workers. It’s true that most Americans who remain uninsured are holding down jobs, according to the survey. Thirty-seven percent work full-time and 19 percent work just part-time. But the preponderance of these uninsured workers hold jobs at small companies and firms that employ fewer than 25 full-time employees. Those businesses are exempt from Obamacare’s legal requirement that employers provide health insurance to their full-time employees or face paying a fine. Nearly six in ten uninsured Americans work for small businesses, according to the study. The study found a myriad of reasons for why so many are still uninsured, but affordability was frequently cited as the major reason that Americans aren’t visiting the on-line marketplaces or enrolling in a program. Consumers have frequently complained about rising premiums and out of pocket costs, and they are facing a new round of increases in many states when the 2017 enrollment season officially begins. 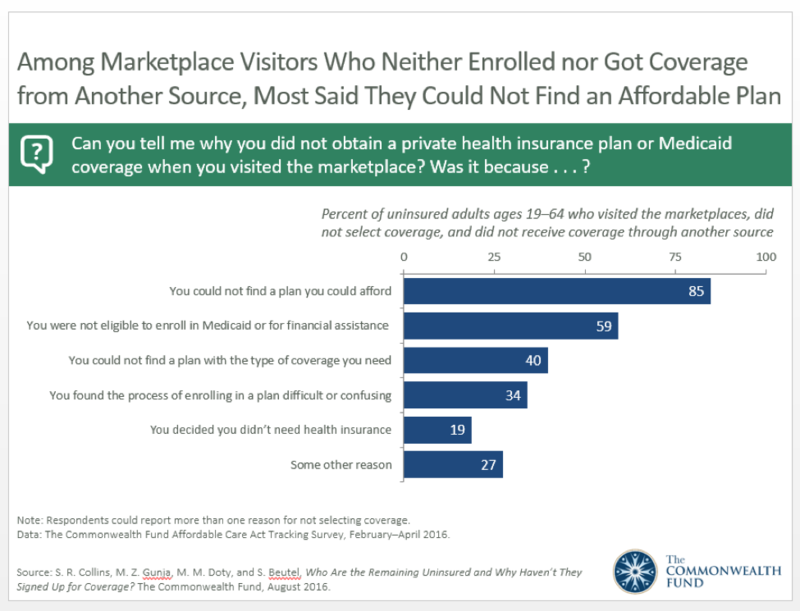 Nearly two thirds of uninsured adults who were aware of Obamacare marketplaces said they had not visited one to seek coverage because they didn’t think they would be able to afford it. In similar fashion, 85 percent of uninsured adults who actually shopped for coverage said they didn’t enroll in the end because they couldn’t find an affordable plan.